Once upon a time there was race of frogs. Many people gathered to see them. "What a pain!!! They'll never make it!!" The frogs began to doubt themselves. What a pain!!! They'll never make it!!" Except for one frog that continued to climb. At the end, he alone, and with enormous effort, reached the top of the tower. One of the quitters approached him to ask how he had done it, to finish the race. because they steal the best aspirations of your heart! Always remind yourself of the power of the words that we hear or read- always think positively. Conclusion: Always be deaf to someone who tells you that you can't and won't achieve your goals or make your dreams come true. Send this message to five people and this will contribute to your steps in trying to make the world a little better. 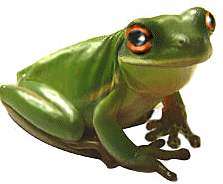 ALWAYS BE A DEAF FROG!